I haven't done a post on origami in a while, so today is the day. Being partial to origami flowers, I thought these violets created by Origami Around were most excellent. 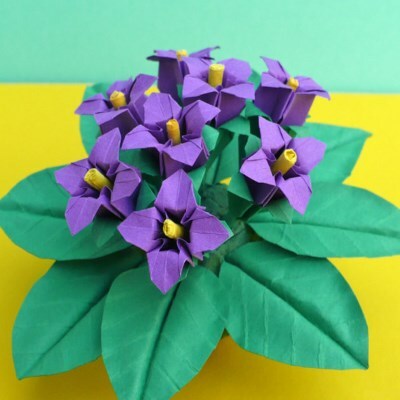 These are not a project for the origami purist as they are created from more than one square of paper and some gluing is involved. Instructions on how to fold the violets may be found here. 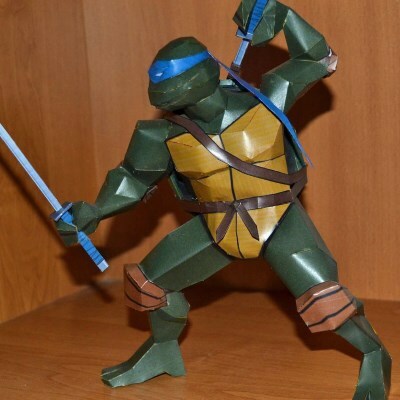 Released in 2009, this Teenage Mutant Ninja Turtle paper model is an "oldie but goodie". Leonardo, the leader of the Turtles, is shown mid-action having one katana sword drawn and the other half out of its sheath. PDF and Pepakura PDO templates are still available for download at Action Papercrafts. The finished model stands 10" (26 cm) tall. Build photo by Two-wisemen. On construction sites, sometimes a concrete pump truck is used to pour concrete in hard to reach places. A flexible boom on the back of the truck allows liquid concrete to be pumped to considerable heights and also up and over obstacles. 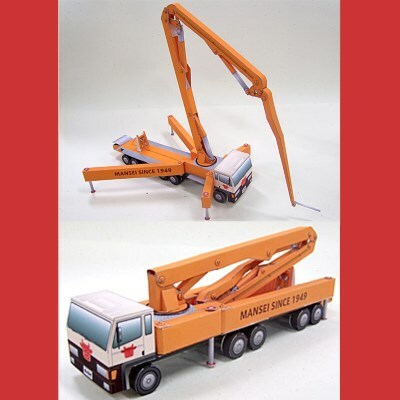 This papercraft pump truck is offered as a free download on the Mansei Restaurant (Tokyo) website. As you can see from the photos, the boom arm and stabilizers are movable. Concrete pumps were first invented by European engineers in the 1920's and 30's. 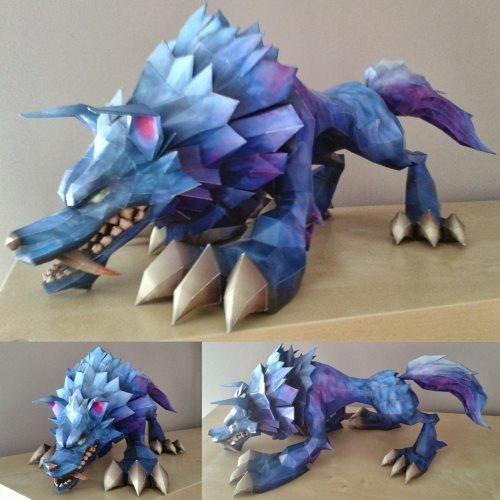 In 2012 I released a template for a papercraft League of Legends wolf. I never had a chance to build the model, so I was happy to find these build photos by DeviantART member JanZonderVrees. Jan did a great job! The template for the model was originally designed by Portaldragon. The League of Legends video game was introduced in 2009. In the Mass Effect 3 video game, one of the non-playable characters is a robot named "Kei-9". 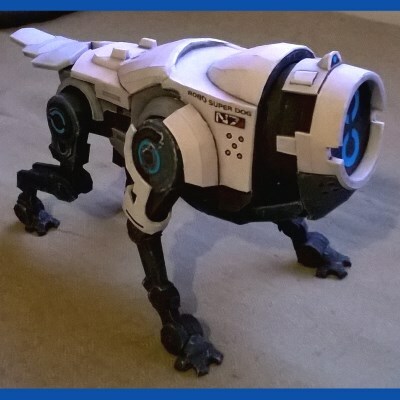 With a label on its side that reads "Robo Super Dog," Kei-9's function is to be a pet. This paper model of Kei-9 was created by DeviantART member Rheia2 who based his design on a 3D model from the game. The papercraft template for the model may be downloaded here. Build photo by DaiShiHUN. 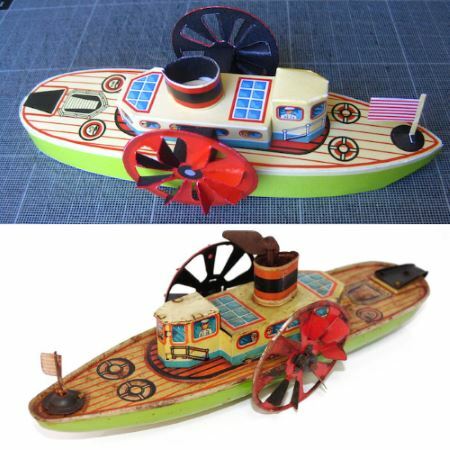 Papercraft designer Patrick Pasques found an old toy: a windup paddle steamer. He loved it so much he decided to create a papercraft version of the boat. The original toy is shown in the lower photo, the paper model in the upper. Patrick offers a download of his creation on his website located here. Tin toys such as this one were popular in the early twentieth century. 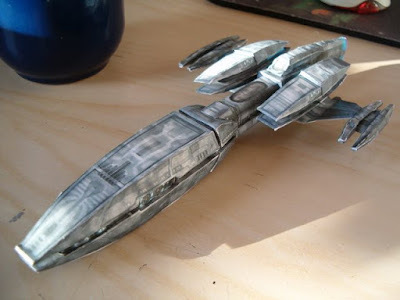 This paper model of the starship Kumari was created by German designer, TarsFerak. The Kumari is an Andorian battle cruiser which appeared on the 2001 television series Star Trek: Enterprise. The blue skinned Andorians have a long history in the Star Trek franchise, first appearing in the original 1966 TV series in an episode entitled "Journey to Babel". The papercraft template for this model may be downloaded here. The scale of the model is 1:1700. Here's one of those DIY, low-poly paper models like we all see for sale on the Internet these days. Only difference is... this one is free! 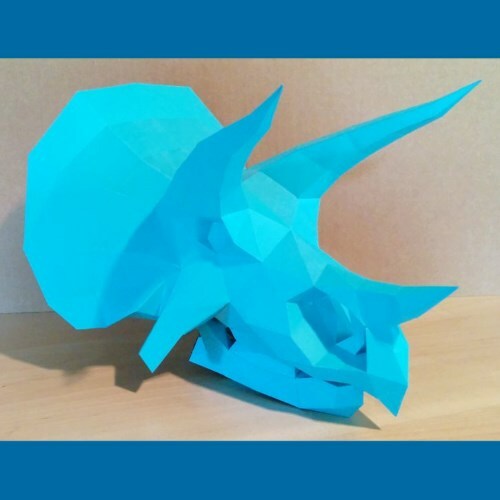 This faceted papercraft triceratops skull was created by DeviantART member, Gedelgo. 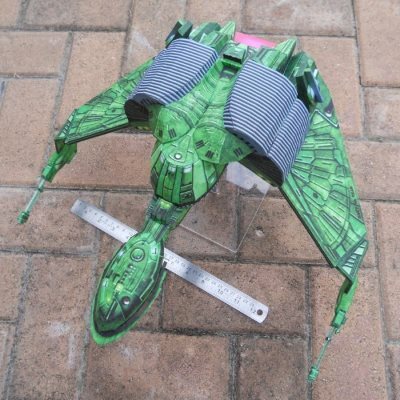 The finished model measures about 35 cm long. A printable template for the dino skull may be downloaded here. Triceratops are thought to have roamed the Earth about 68 million years ago.